A private exhibition archaeological objects by of A.L. 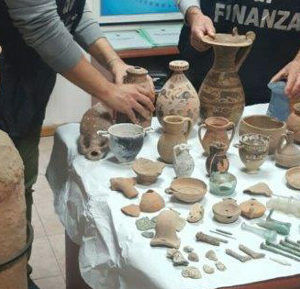 in Olbia, Italy, rises again the discussion on who is allowed to keep and exhibit such objects.About 77 objects of Etruscan and Roman origin were found. In Italy, private persons are obliged to proof the legal ownership of the archaeological objects, and have to inform the Soprintendenza in case the bought, inherited, or received in other ways (e.g. donation) such objects. Every transfer, or change in ownership, has to be declared as well (D.Lgs. 22 gennaio 2014 n.42; Codice dei beni culturali e del paesaggio). The 77 objects found in the house of A. L. in Olbia where sequestrated by the Guardia di Finanza, since A. L. did not have any of those documents as noted above. You can find a video about this case here. 2017-02-03 in Illegal excavations, Italy, Selling of unprovenanced items.